A shortage of cattle and more quality required with the best sorts selling well. Top price to 233.5p, 231.5p, 229.5p all for Limousin heifers shown by A & W J Taylor & Son, Dashwellgreen. Young bulls sold steady and topped at 169.5p or £1,427.70 for a Simmental from D C Houldey, Kirtleton House. A small show of OTM cattle sold similarly on the week and sold to 142.5p for a Simmental from B J Waugh, Uppertown Farm. A very disappointing show of 2,243 prime hoggs was forward to a full ring of buyers all keen for sheep to tide them over Easter. Many people got it wrong that they would experience a bad trade due to Easter holidays. 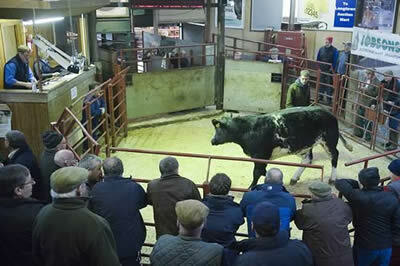 The sale average was 219.15p/kilo (229p SQQ), many more could have been sold to advantage. 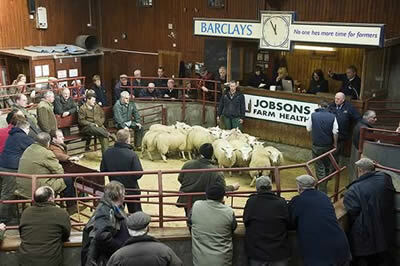 The sale topped at £122 for Texels from The Land and to 289.5p for Beltex from Watchhill, Canonbie. Blackface £98 Boat Croft, £95 Peela Hill, £94 Yett, £90 West Scales. Suffolk 243p Hyde Park, 234p Hillhead & East Cliff, 226p Hyde Park, 223p The Land, 216p Hyde Park, 213p Plantation Cottage. Swaledale 188pm 172p, 166p Knaresdale House. Cheviot £85 Whinneyknowe, £81 Ericstand, £80 Gateside. A lighter show of 2,728 cast ewes and rams was forward to the usual ring of buyers all keen for sheep to tide them over the Easter weekend. Trade was buoyant especially for light and lean ewes which were sold at extreme rates. Heavy ewes similar on the week and rams sold to a great trade. Top price was £172 for Texel tups from Drumlane and to £130 for Texel ewes from Tundergarth Mains & Churchside. Suffolk £154 Shielswood, £140 Basco Dykehead, £137 Beragh, £136 Carpet, £143 Plumbridge, £132 Treventer, £131 Matinley, £130 Woodvale; Charollais £150, £142 Upperlands, £140 Drumlane; Leicester £120 Knaresdale House; Beltex £114 Beragh, £110 Tarnside, £106 Streethead; Dorset £120 Upperlands. Light Ewes Cheviot £88, £85 Hillcrest, £83 Hillcrest; Blackface £84 Ladhope, £80 Edges Green & Peela Hill, £79 High Row, £78 High Wood, £76 Gall, Ladhope & Weatherhouse, £75 Wyliehole; Swaledale £79 Shankfieldhead, £78 Spoutbank, £72 Highside, £68 Kirkland Green, £67 Cotland; Herdwick £60 Kilncroft; Jacob £64 Maidencots; Lleyn £84 Tarnside, £78 Higher Bughill; Beulah £69 Higher Bughill; Shetland £46 Tarnside; Easycare £65 Hillcrest.